Damian Lillard is taking clutch to a whole new level. The second-year guard drained a 3-pointer to bury the Cleveland Cavaliers on Tuesday, 119-116. That would be impressive enough on its own, but when added to his game-winner over the Pistons just one game earlier on Sunday, Lillard’s shot becomes part of a pretty impressive trend. The reigning NBA Rookie of the Year has gotten even better in Year 2, teaming with power forward LaMarcus Aldridge to make the Trail Blazers a surprise contender in the Western Conference. Lillard is averaging 20.1 points and 5.7 assists per game for the first-place Blazers, who lead Oklahoma City and Denver in the Northwest Division — and actually sport the best record in the NBA. If Lillard keeps hitting game-winners, Portland will have a lot more to celebrate than mere division crowns. 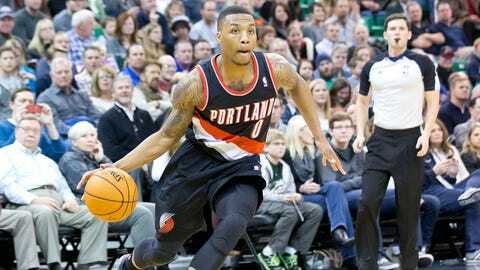 Check out Lillard’s heroics in the videos below.